I stumbled across this new and “interesting” Bridesmaids collection a few weeks ago and have been waiting patiently to feature this for our Tuesday’s Trendwatch. I honestly have not seen a bridesmaids dress this intricate and fabulous as this before – truly I am just sort of mezmerized. 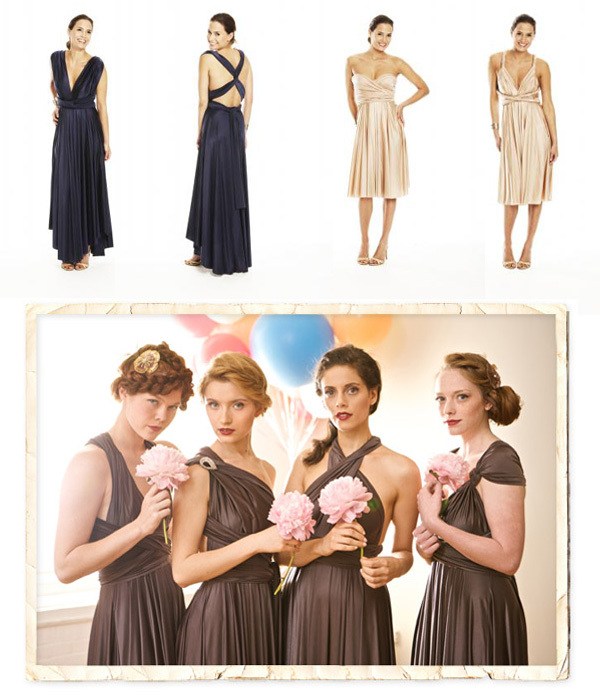 Twobirds Bridesmaid, a collection of dresses that can worn specific to your personality 15 different ways with using the same dress. The bodice of the dress can be tied, shaped, looped or wrapped. Still confused? Now you know why I have been so mezmerized. The designs of the dress are so unique and classic and truly you can wear this dress again and again. Wrap the top of the dress and wear as a one-shoulder design, or loop around your neck to wear as a halter, or how about even wrap around to wear strapless. Its just simple yet elegant. I just cant get enough of it. Check it out…. I promise you will not be disappointed.